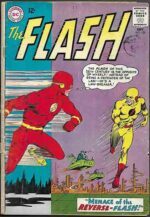 *DC: After #123 (‘Flash of Two Worlds’, as if you need telling), and the premier issue (#105), probably the most in-demand issue of the Silver Age Flash is #139, which featured the first appearance of Professor Zoom, the Reverse-Flash, Barry Allen’s super-swift nemesis from the far-flung future, whose appearances in the popular Flash television series have caused his early appearances to zoom (sorry) upwards in value. 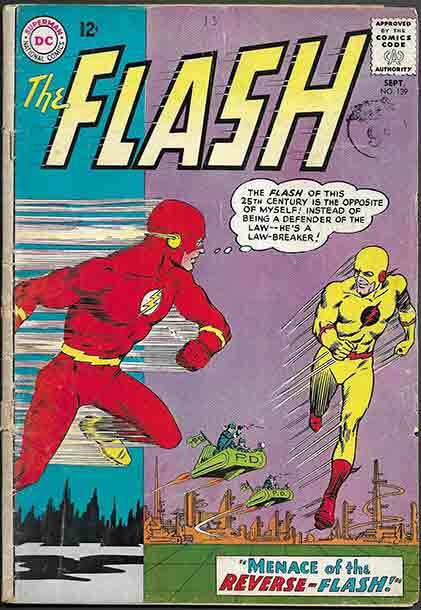 We are delighted to welcome the Reverse-Flash back into our inventory – though we anticipate not for long. Clean and sound, with moderate spine, edge and corner wear, but unimpaired cover scene, slight fading at top and right cover edges, but firm staples at cover and centrefold, this copy is GD p £75.